The Pain Eliminating Cupping is a set of 17 plastic suction cups for back and shoulder pain relief. The cups are durable, light weight, and easy to use. The cups promote pain relief by decreasing inflammation and increasing the flow of blood in the body. They are intended for those experiencing chronic back pain or shoulder stiffness and want the sense of relaxation and well-being. The cups come in four different sizes within the 17-cup set. 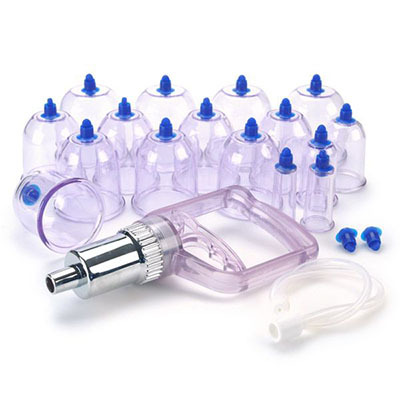 Included with the Pain Eliminating Cupping Set is a suction hand pump and carrying case. Dimensions: 13.25" x 9.5" x 3"
The 17 Piece Plastic Cup Set with magnets applies a mild acu-pressure to the body. The cups promote pain relief by decreasing inflammation and increasing the flow of blood. 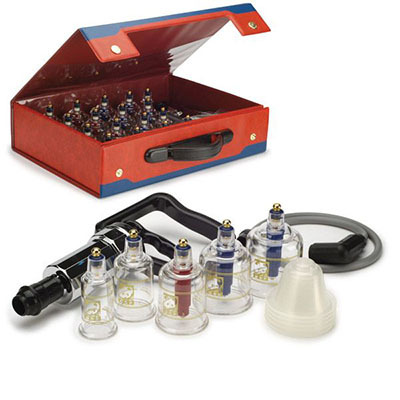 Each set includes 7 red and 8 blue color coded, 0.3" dia, 1,000 gauss, spring adjustable, 0.3" dia x 1.7" long, removable magnetic insert probes. These fit the 2" and 1.5" dia cups. Set of 17 includes 13 of the 2" dia cups and 1 each of the 1.8", 1.5", 1.3", and 1" dia cups. Each set comes with a pistol grip hand pump, extension tube and carrying case. 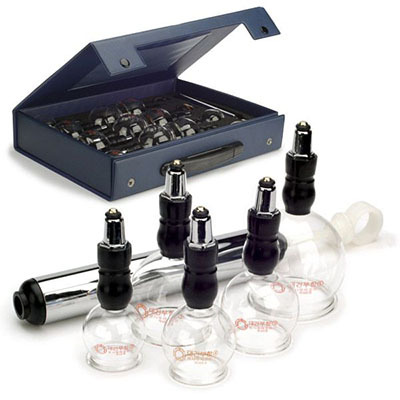 The 14 Piece Glass Cupping Set is a great modern, hand suction set. The lightweight, thin walled, sturdy glass cups offer a comfortable feeling on the skin. The cups promote pain relief by decreasing inflammation and increasing the flow of blood in the body. Set of 14 includes 8 of the 1.8" dia cups and 1 each of the 1.5", 1.4", 1.3", 1.2", 1" and .8" cups. Each set comes with a straight hand pump and carrying case. 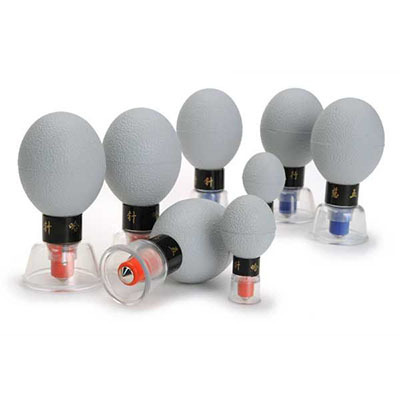 The Longevity cup set is a sound choice for cupping therapy. This set of 14 lightweight, strong glass cups comes in a wide choice of sizes ranging in diameter from 1 inch to 2 3/8 inch. Smooth edges provide maximum comfort. Vaseline or simply warm water may be applied to edges to enhance suction. Can be sterilized by autoclave or with alcohol. Set of 14 includes the following diameter cups: 2 3/8” (8), 2” (2), 1 5/8” (2), 1 ½” (1), and 1” (1). Each set comes with a pistol-grip hand pump and carrying case. The 10 Piece Deluxe Cup Set contains plastic cups that are designed to be shock and heat resistant. This allows them to be sterilized in boiling water. Each cup features release air-locking valves that are easy to use. 10 Piece Set includes: 2" diameter (7), 1.8" (1), 1.6" (1) and 1.3" (1). Each set comes with a pistol grip hand pump. 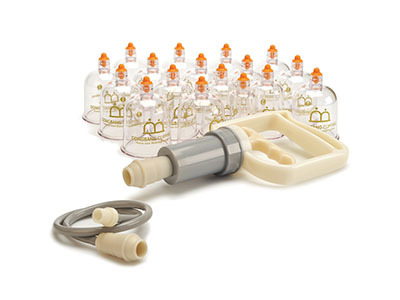 The Haci Deluxe Cupping Set combines acu-pressure, bio-magnetic, and cupping therapy in a single synergistic treatment. These suction cups feature high quality silicon squeeze bulbs as well as a silicon coating on the lip of the cup for improved comfort. Each cup contains a powerful 0.3" diameter magnet, color-coded red bionorth (-) or blue biosouth (+) that contacts the skin during use. Cups may be used with lotions, oils, or creams to improve suction. Set of 10 cups includes the following diameter cups: 0.6" (2), 1.2" (4), 1.4" (4). 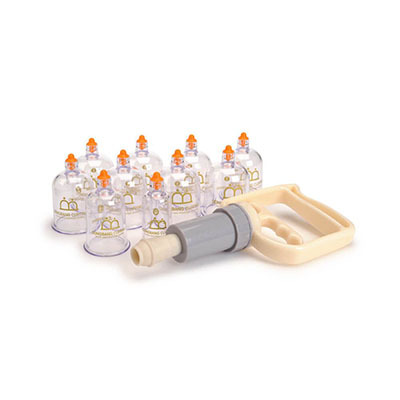 The Haci Cupping Set combines acu-pressure, bio-magnetic, and cupping therapy in a single synergistic treatment. Each cup contains a powerful 0.3" diameter magnet, color-coded red bionorth (-) or blue biosouth (+) that contacts the skin during use. Use a skin lotion to enhance suction. Set of 8 includes 2 each of the following diameter cups: 0.5", 0.9", 1.1", and 1.3". 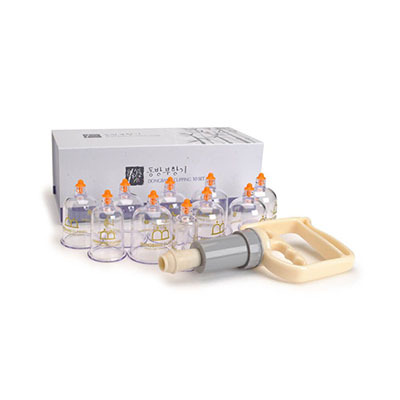 The Haci Cupping Set combines acu-pressure, bio-magnetic, and cupping therapy in a single synergistic treatment. Each cup contains a powerful 0.3" diameter magnet, color-coded red bionorth (-) or blue biosouth (+) that contacts the skin during use. Use a skin lotion to enhance suction. Set of 12 includes 2 each of the following diameter cups: 0.5", 0.9", 1.3", and 6 of the 1.1" diameter cups. The Longevity cup set is a sound choice for cupping therapy. This set of 16 shock and heat resistant plastic cups comes in a wide choice of sizes ranging in diameter from 0.7 inch to 2.5 inch. These cups are fully transparent and can be easily sterilized in boiling water. Set of 16 includes the following diameter cups: 2.5” (4), 2.1” (8), 1.6” (1), 1.3” (1), 0.9” (1), and 0.7” (1). Each set comes with a pistol-grip hand pump, an 18” plastic extension tube, a short booklet, and black nylon carrying case.